When you have an Elliptic Zone of Influence selected in the Network view, you can convert it to a Shaped Zone type using the option Convert Elliptic Zone of Influence to Shape . 2. In the Network view, select the deformer module that has an elliptic Zone of Influence type. 3. 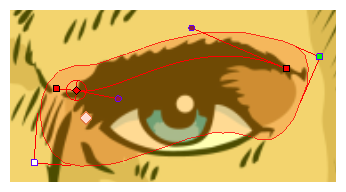 In the Deformation toolbar or Rigging Tool Properties, click on the Convert Elliptic Zone of Influence to Shape button. The Zone of Influence will automatically be converted to a shape. It will keep the shape it was when the button was pressed except, control points will appear all around the zone to allow the shape to be customized. Refer to the section Setting up a Shaped Zone of Influence below to learn how to customize a shaped Zone of Influence.